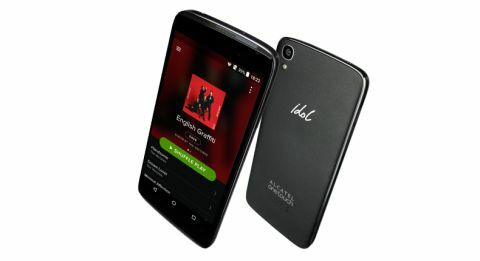 Alcatel OneTouch Idol 3 (4.7) review | What Hi-Fi? Alcatel may not make as much noise as its American or Korean rivals, but when it does, it is worth paying attention. If the Alcatel OneTouch Idol 3 is anything to go by, this company is going places. First things first: the Alcatel OneTouch Idol 3 comes in two sizes, with 5.5in and 4.7 screens. The former has bumped-up specs, but the latter (our test model) is aimed squarely at the midrange market. It might not have Apple or Samsung quaking in their boots, but it’s surprisingly good. For about a third of the price of flagship models, the Idol 3 does many things spectacularly well. The Idol 3 doesn’t look spectacular – in fact it’s rather nondescript. The front is black, symmetrical and unbranded; the back plastic with a light brushed-metal effect. It won’t fool your hands, but eyes are easily deceived. The same goes for the chrome-effect edges. If you’re looking for something down to earth, this is it. It feels good to hold. The plastic build makes it very light, but it feels solid enough, and fits nicely in the palm. We’re not entirely keen on the button placement – power on the left, volume on the right. Now we know how left-handed people feel. If you just can’t get used to the idea, the Idol 3 also knows LG’s shortcut of double-tapping to turn the screen on. And if that’s not enough, get ready for Alcatel’s party trick. The screen automatically rotates to stay upstanding, and there are speakers and microphones on both ends of the device. Say goodbye to taking your phone out of your pocket and finding it upside down – this Alcatel doesn’t know the meaning of those words. Is it necessary? Probably not, but it is useful. Once the novelty of flipping the screen over and over wears off (it took a while), we set it in a horizontal position and load up some videos. The 4.7in screen is a pleasant surprise. We’ve already seen with the Apple iPhone 6 that top specs aren’t everything, and the Alcatel’s 720p screen reaffirms this. Colours are dynamic. Contrast is good. Skin tones are convincing. Even the viewing angles are generous. It doesn’t have the Samsung Galaxy S6’s level of detail and contrast, but at this price, the Idol 3 is definitely punching above its weight. It’s a theme that continues as we put it through its paces on sound. It isn’t as loud as it could be, but thanks to collaboration with American audio company JBL, it is clear, coherent and coordinated. It doesn’t quite match the Apple iPhone 6’s level of musicality, but it’s still a good listen. The front-facing stereo speakers are loud and solid, giving HTC’s Boomsound speakers a run for their money. The built-in music app doesn’t just play tunes, either – you can try your hand at mixing in Music Centre mode, which turns your Idol 3 into a bona fide DJ station. Even the camera has a surprising amount to offer. It’s a good 13-megapixel snapper, capable of shooting vivid colours and a decent level of detail. It’s not as sharp as we’d like, and high dynamic range mode is a little overblown, but again, it turns in a solid performance for the money. We wouldn’t expect it to match the stunning performance of the LG G4 in the camera department, but the Alcatel does offer manual controls: white balance, shutter speed, ISO and focus. Operation is fine. The 1.2GHz processor and 1GB RAM is more than capable of keeping things ticking along. Just don’t expect the same lightning speed and multitasking skills you get from the Samsung Galaxy S6. The system runs on Android 5.0 Lollipop, with Alcatel’s own software laid on top. It’s close enough to stock Android that we don’t find ourselves put off. Battery life is about average for a midrange phone. It’s a sealed 2000mAh battery: no problem getting through a normal day with average use, but loop a 720p video and it will last about seven hours. Internal storage is 8GB, but you can (and should) add a microSD card. We’re very impressed with the Alcatel OneTouch Idol 3. It’s a midrange phone that punches well above its weight, and at almost a third of the price, the big flagship models have cause for concern. It’s not perfect, but if you’re not after a premium phone with all the bells and whistles, this is well worth your attention.